Update: 12/1/2014 – Updated svn to subversion due to Mike Hammett’s feed back. Update: 12/8/2014 – Updated cron find command. So documentation on this one is a little weak. Fortunately, this guy has blazed a trail for us. We need to add a group for rancid to store configs in. We need to create the folder structure. We need to create a .cloginrc file. I’m backing up mostly Mikrotik devices so my config is a little different. Check it out in Observium. You should see a config tab with your configs there. If you want rancid to back up daily, then add something like this to cron. Add the syslog line to Observium’s config.php. By default Rsyslog does not accept remote syslog information. We have to take the remote syslog information and redirect it to Observium’s processor. Under the device in Observium there should now be a syslog entry under Logs. Any syslog entries will show up here. Updated 11/12/2014 – Added smokeping cgi link at bottom of post. Update 12/1/2014 – Adjusted smokeping cgi link at bottom due to Mike Hammett’s feedback. Updated from restart to reload in cron job. Lets get smokeping integration going. We are going to have to make some changes to both apache2 and Observium. Observium has scripts which generate the config. Lets run it and see what it generates. Ok, so lets actually put the config in place. Be aware – If this server is going to be on the internet, you may want to protect smokeping’s pages using an apache realm. There is no other password protection that I’m aware of. You can remove the file from /etc/apache2/config.d/smokeping if you want to disable this. If you want to generate the smokeping config file you can add the command to cron, but don’t generate it to often as it can lead to gaps in recorded information. 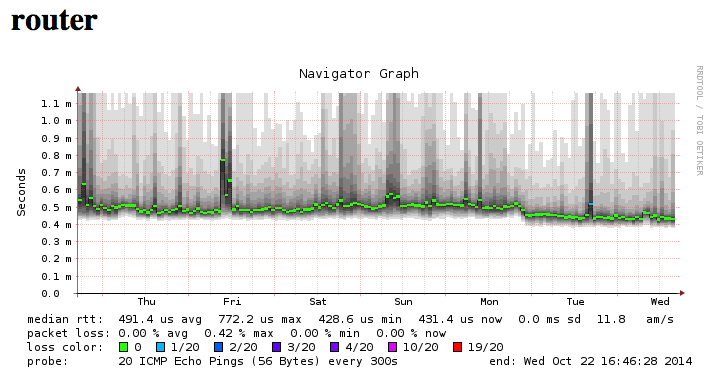 Also, if smokeping doesn’t finish in it’s allotted 300 seconds, it can cause gaps in graphs as well. Multiple recipients can be defined as well. If you are having issues getting the mail to send, make sure that you actually have a device added and you are using it’s name for the test. Also exim4 needs to be set up correctly. This is an excellent resource. We are going to be installing the Professional edition of Observium, not the Community edition. I’m starting with a fresh install of Debian Wheezy using the Netinstall iso. I only install SSH and the standard system utilities. Much of this comes directly from the Observium installation guide. Login with SSH. Get root. During installation of mysql you will be prompted to enter a password for the root mysql account. You’ll need this later. If you don’t already have your subversion credentials go ahead and create them now. Subscribe and then email your credentials to Adam. You want to send the username and SHA line, not the actual password. To ensure that your access is processed quickly, please provide enough information for us to be able to locate your PayPal payment. Usually the email address and name of the payer is sufficient. This is a manual process so it may take between a day or two. It’s going to ask for the username and password that you sent to Adam here. Just hit return for the root password and it will ask for username. possible. See the documentation for details. Edit the config file and update the mysql username and password. Lets move the logs to the standard location. Time to set up apache. I finally moved the blog off EC2 and RDS. It was crashing, usually with the CPU at 100%. I couldn’t get into it to see what was going on when it would happen. Oh well. New home. Some of the graphics uploaded are broken. I’ll look at fixing that at some point. The wp-content/uploads folder didn’t fully copy over. It’s copied now so images are back. Netflix has an ISP Speed index out now. The FCC is looking at adding an extra 195 Mhz to the 5 GHz range. Currently, the 22 channels (13 usable without all that DFS mumbojumbo) will increase to a whopping 35 channels. Here is a good article about it all. Renesys has spent some time analyzing Sandy’s impact on the routing table Monday night. They made an animation which shows routes being removed during the storm. Here’s another quick view of the impact on the routing table as Sandy came ashore Monday night. Each square represents the fate of a set of networks geolocated within a common tenth-degree square of the Earth’s surface — at these latitudes, that’s about 90 square kilometers. At one end of the scale, the darkest green indicates better than 99.95% of the networks are available. At the other end, solid red indicates that more than 5% of the networks at that location have been removed from the global routing table, meaning that they can’t be reached by anyone. Five percent doesn’t sound like much, but consider the Internet density in the affected areas! In fact, Manhattan’s outage rates were much higher — on the order of 10%, which is impressively low given the fact that ConEd cut power to much of the island. Silencing ten percent of the networks in the New York area is like taking out an entire country the size of Austria, in terms of impact on the global routing table. The 90% that survive are in data centers, running on generator power supplied by engineers who do not sleep much. It’s striking to observe not only the impacts in NYC, Long Island, and New Jersey, but also peripheral weather-related outages in the Washington DC area, and up the I-93 corridor from Boston into New Hampshire. The Internet has become a sensor network in its own right for determining where storm damage is occurring — and since BGP routing converges in realtime, that information literally becomes available within a few seconds.